Most people who leave the United States and move to the Caribbean dream of the freedom of perfect beaches, warm winters and tropical fruits. Vince Cate says he sees a world where he has complete freedom to write computer software and send it around the world. Cate, a resident of Anguilla in the Caribbean, said he wanted to "be free from the silly U.S. laws on crypto." In 1994, Cate moved to Anguilla and helped bring Internet service to the tiny island. Last Sunday night, he went a step further and flew to Barbados, site of the nearest American consulate, to fill out the paperwork to renounce his U.S. citizenship. 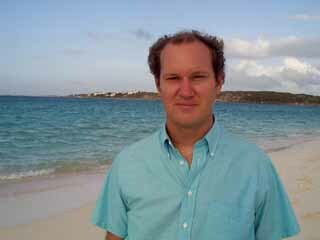 Cate, an encryption expert and one of the sponsors of an annual academic conference on financial cryptography in Anguilla, said he made the decision because he is setting up a new company, Secure Accounts, that will design and build basic software to handle electronic transactions. The software will rely heavily on encryption to scramble the data traveling between users in order to prevent fraud, theft and embezzlement. After renouncing his citizenship, Cate said in an e-mail message that he wanted "to be free from the silly U.S. laws on crypto." Normally, setting up an international company does not require forgoing citizenship in the United States, but Cate's expertise in creating encryption software places him in a special class. If he were to offer any advice to non-U.S. citizens about the encryption work built into his financial transaction software, he would violate U.S. laws, which treat the transfer of such encryption as illegal international arms traffic. These laws apply throughout the world and are intended to stop U.S. citizens from assisting others in developing encryption software. "I'm not actually writing any crypto code," Cate said in a telephone interview on Thursday. "But I'm supervising people who are." The U.S. government treats secret coding software in the same way it treats howitzers, tanks and chemical weapons because it can allow foreigners to hide their communications from U.S. intelligence-gathering organizations. In past wars, the United States gained important advantages in the field of battle through carefully gathered information, and the government does not want to lose what it sees as technical high ground. Many American software companies, however, see themselves losing market share to foreign competitors who are able to create encryption products unhampered by U.S. laws. They argue that good cryptographic expertise is already well distributed around the world and that the laws only give foreign competitors an advantage. "We can provide a solution that works over the whole planet." Cate said of his company. "U.S. companies can only provide a solution that is U.S. only. We certainly have a competitive edge by being offshore." Recently, many leading software companies like Sun Microsystems and C2 Net have opened branches outside the United States, hiring foreign nationals to do the work. This has required a complicated dance to avoid breaking U.S. export laws like the ones that Cate is escaping. Steve Walker, the former president of the encryption manufacturer Trusted Information Systems, said of Cate's move, "All of us have thought from time to time that we're fed up with things, but in reality it doesn't accomplish much and you give up a lot." Sameer Parekh, the president of the Web server company C2 Net, said: "I think it's essential if you want business that you're doing your development overseas. It's pretty clear to anyone internationally that anything exportable [from the United States] is a joke." C2 Net has development offices in Anguilla and Newbury, England. Parekh says that there is great demand overseas for programmers who know cryptography. Walker agreed that American companies are hurt by the existing laws. "There are foreign companies out there who are doing very well," he said, "in part because they're selling products out there that the U.S. can't sell." Rozell Thompson, a lawyer who specializes in negotiating export licenses, said of Cate's decision: " I think that's pretty unnecessary in this particular case. If you're developing crypto for financial applications, it's exportable anyways. There's a recognition that cryptography for electronic commerce applications is going to be exportable." The government is more lenient with software used by banks and other financial institutions, in part because it recognizes the great need for such software and in part because it already receives reports about much of the transaction data cloaked by the encryption. Thompson said that Cate would probably have been able to negotiate some sort of license with the U.S. government, although this would have taken months and would need to be repeated for each new project. Cate's move also illuminates a bit of the international market for citizenship. Before renouncing his U.S. citizenship, Cate became a citizen of Mozambique for a fee of about $5,000. "This makes me an American-African," he joked. Cate's current home, Anguilla, requires people to wait 15 years before applying for citizenship. He moved there in 1994 and has worked to establish strong ties. In his spare time, he runs a computer club that places old computers in the island's schools. "The computer club is also my best source of talent searching," he said. "I have hired three students right out of high school because I knew them from the computer club." Edward Betancourt, a lawyer for the U.S. Department of State, said that the notion that a person could freely choose their citizenship dates back to the war of 1812, when British warships would often capture Americans under the argument that they were really British subjects. He said: "Most people seem to renounce for family reasons. They haven't lived in the U.S. for some time and they don't want to deal with another bureaucracy. Whether a person articulates [the decision] to us or not is up to them. In most instances, people say 'I'm grateful to the U.S. and it's not done in anger.'" In 1996, the latest year for which data is available, 612 people lost their citizenship. This number includes people like Cate who renounced their citizenship, as well as others who expatriated themselves by serving in foreign governments. The government requires a lengthy interview, in part to determine whether people are leaving for tax reasons and to ensure that the decision is made correctly. Right now, Cate sees several advantages in his choice. "There's less chance of getting in any trouble with the U.S. government and there's also less chance of getting shot by a terrorist," he said, referring to the recent actions targeting U.S. citizens. Peter Wayner at wayner@nytimes.com welcomes your comments and suggestions.